of your Giant-Size aircraft, Jets and Helicopters! Separated Power Busses isolate servo noise and loads from the Rx! Protects the Rx from stalled servos and power line transients! Optically-Isolated and Amplified Control Signal to servos. Worry-Free operation with many large servos driving heavy loads! Big and Hefty for maximum power to servos! Complete with all wiring and connectors, ready-to-go! What is Optical Isolation? What is the difference from an optically-isolated and non-optically isolated power bus systems? Optical isolation is true and total electrical isolation. There is no possibility of conducted interference propagating along a common ground. This is so effective, our EDR-111 and its derivative are employed on NASA research UAV's, and several other University Aerospace department research projects. Ability to charge both Rx and servo batteries simultaneously from one multi-output charger, or two DC field chargers using the same 12V field battery. A common ground often confuses chargers so that one or both batteries does not get a full charge, or worse, damage to the charger or batteries can occur. With a non-optically-isolated system, you have to physically disconnect (i.e., unplug) at least one of batteries before charging, or charge them one-at-a-time. With our EDR-111 there is no such inconvenience or possibility of damage due to "senior moment" error. Do you make a larger power backer? I'm using a 10-channel radio. Each channel on the Pow'R Back'R is capable of driving up multiple servos thru Y-harnesses (several of our Aerospace flight test customers have used it this way). 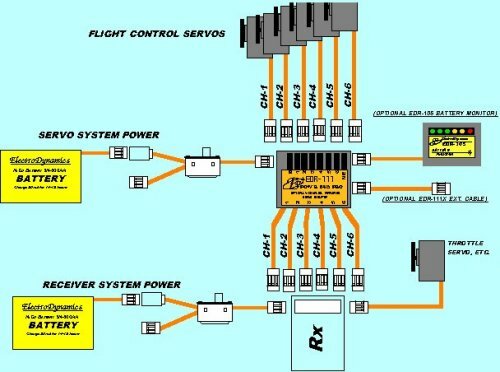 So, for instance, a dual elevator or aileron setup need only use one channel. 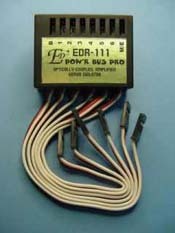 The EDR-111 is also compatible with "Matchboxes" or "Servo Synchronizers", so than one channel can drive a "Matchbox", which then matches/mixes and drives multiple servos (on a giant-size aerobatic airplane aileron, for example). You can always add a second Pow'R Back'R in an installation that requires more than 6 channels. What is the maximum load current the EDR-111 can carry? The EDR-111 has a continuous current (all channels combined) capacity of 12 Amps, and a 10-second pulse load capacity of more than 30 Amps. Heavy-Duty (22AWG) cable max. current capacity is 8 Amps. Connector pins on standard servos and batteries are rated at 3 Amps max. What size batteries can be used with the EDR-111? You can use either 4.8V or 6V batteries on the EDR-111. There is no limit on the capacity of the batteries.